This post brought to you by At Home. The content and opinions expressed below are that of DIY beautify. 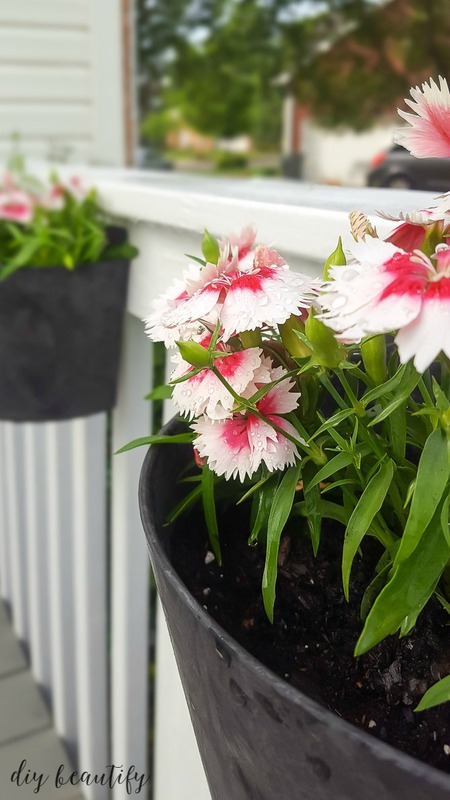 Sharing some simple updates to our patio to help invite Spring! We were in Atlanta for a few days and stopped in at At Home Decor Superstore. My patio was in need of a refresh for Spring and I desperately wanted to bring in some color and fun pieces to brighten it up. We painted our patio last Fall, giving it a cottage feel, but it needed color and warmth! A great patio needs to be ready for family and friends and outdoor entertaining! I went a little loopy when we first walked into At Home! Imagine this...a sea of home decor goodies as far as the eye can see in every direction! If you've shopped there, you'll know just what I mean! 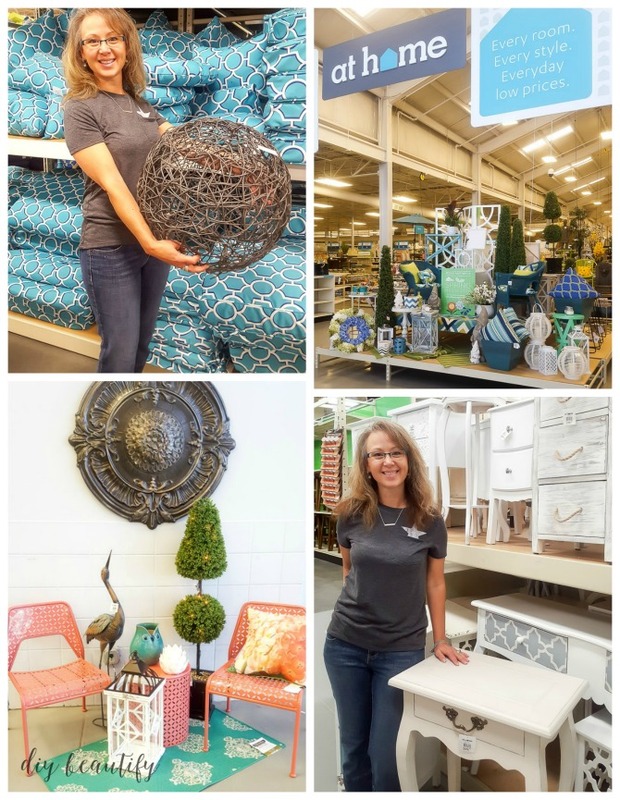 It's a home-decorator's paradise! I was like a kid in a candy store! Luckily Little DIY (my 11-year old dd) reigned me in and we strategized together. 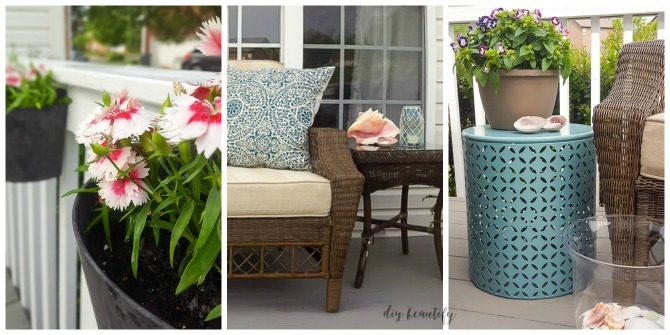 I was there for patio decor - not redecorating my entire home! Whew, serious financial crisis averted! The At Home Patio and garden area was large and well stocked and we spent quite awhile trolling the aisles, searching for the perfect pieces. 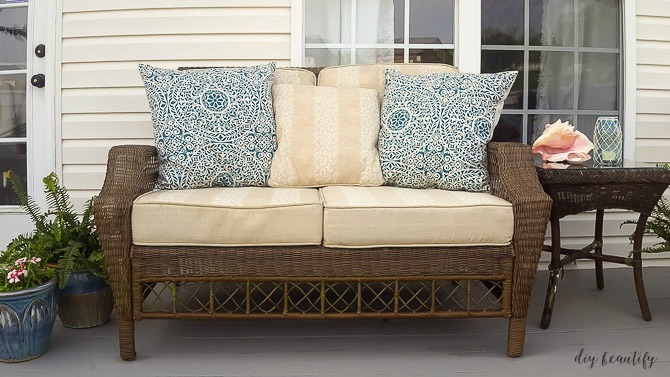 The Outdoor Decor Collections and vignettes through the store made it helpful to imagine what my patio could look like. Let me show you how our patio looks now that we've done a little decorating. 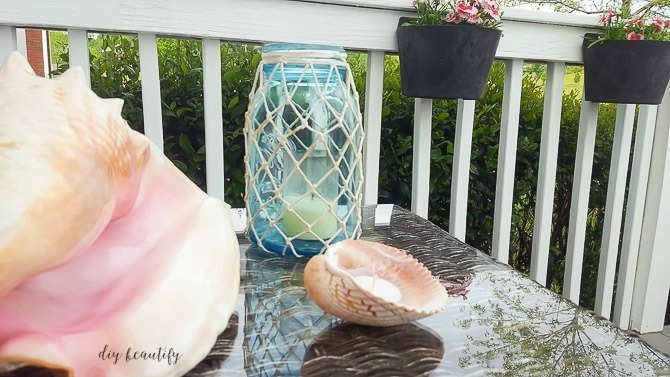 If you know me and have been reading diy beautify for awhile, you'll not be surprised that I went with turquoise accents for my patio decor! It's the color I gravitate toward time and again, and shows up in various doses in nearly every room of my home. 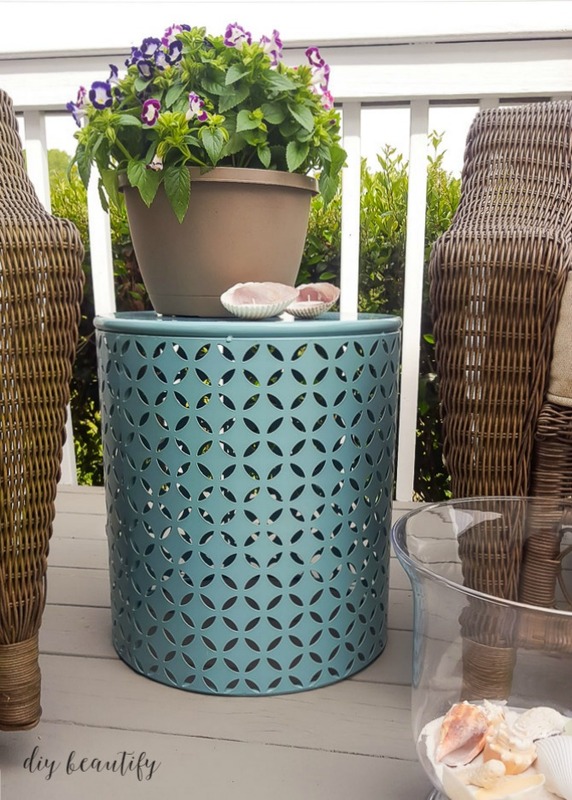 This diamond stamped turquoise end table was the perfect fit between two patio chairs. 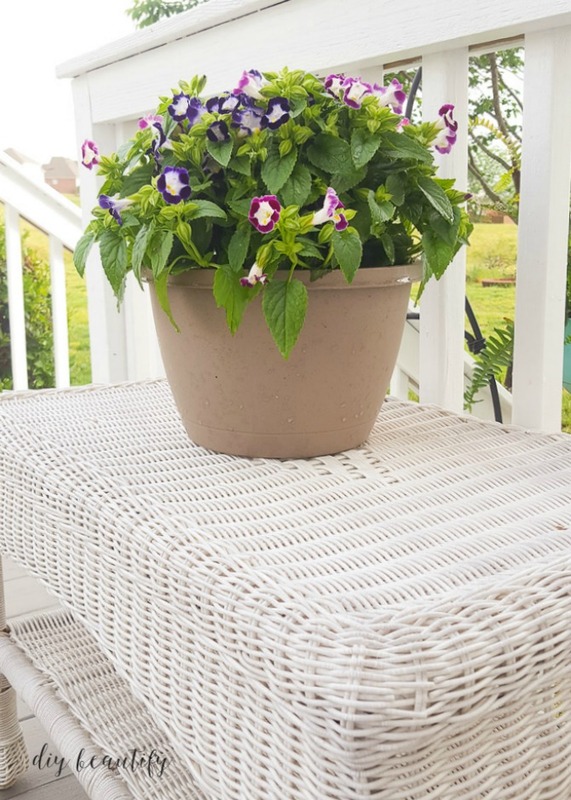 The surface is large enough to hold a pot of flowers, drinks, a magazine or even a plate of goodies. Any time I'm decorating or refreshing a room, new pillows are a must! 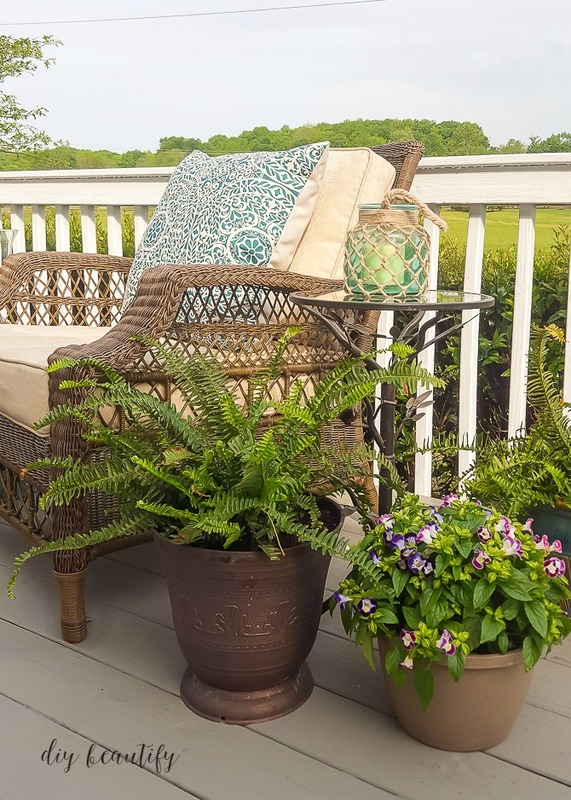 They add so much warmth to any space, including the patio. I fell in love with these teal medallion pillows. They add a big, bright dose of color to my rather bland deck cushions. I was also shopping for some kind of flower planter that I could hang along our deck rail. These ones I found are ideal for any space! I picked three and planted them with bright pink flowers. Mr DIY hung them up side by side. I love that they have a reservoir to hold water so the plant can drink as it gets thirsty! Fingers crossed I can keep my flowers alive all Spring and Summer long! Our patio now feels ready to welcome the warmer days of Spring! It's got color and personality, and I'm so pleased with the items I found at At Home to brighten it up! It would have been fun to buy something for every room in my home; good thing my daughter was with me to keep it real! How's your patio looking? You don't need to spend a lot of money to bring it into the Spring season; just a few key items can make all the difference! Your patio looks great! Love the furniture and the flower pots filled to overflowing. Thank you Stacey! It's always fun to add some new pieces and freshen up a space! I'm looking forward to spending more time on our patio now that it's prettied up! Good luck with your pond! It all turned out so beautiful! 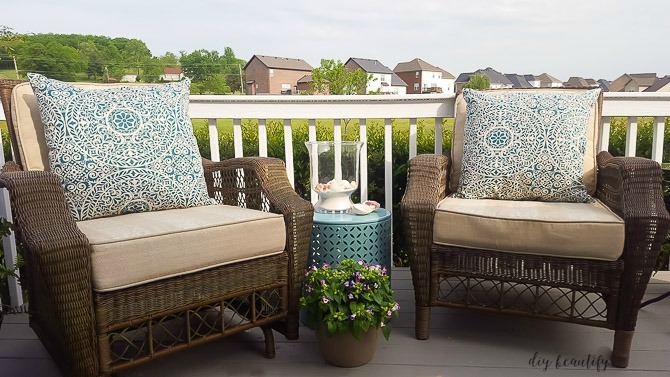 The teal medallion pillows and diamond stamped end table were great choices and something I would have purchased too - only if At Home was anywhere near me. One day I'm going to get to one of those stores! Thank you Rose, it was a fun shopping trip! Sounds like we have similar tastes...I hope you get the opportunity to visit an At Home store soon!! Looks wonderful, so inviting. I love the At Home stores with all their outdoor things. Thanks for sharing. You're so welcome Brooke! You're right, At Home has a ton of options for every price point...a fun place to shop! Love At Home - traveled from Florida to Nashville to get to go to a store (okay, actually I was visiting my daughter - BUT I did tell her I wanted to go shop). Had so much fun - really the closest store is a little closer than Nashville, but still two hours away! Will have to plan my trips! Beautiful job on your patio! Haha, isn't it funny how we plan trips around shopping? I do the same thing! Hope you enjoyed your time with your daughter, and that you got to visit At Home! first of all, i want a home decor superstore! what is this magical place?!?! 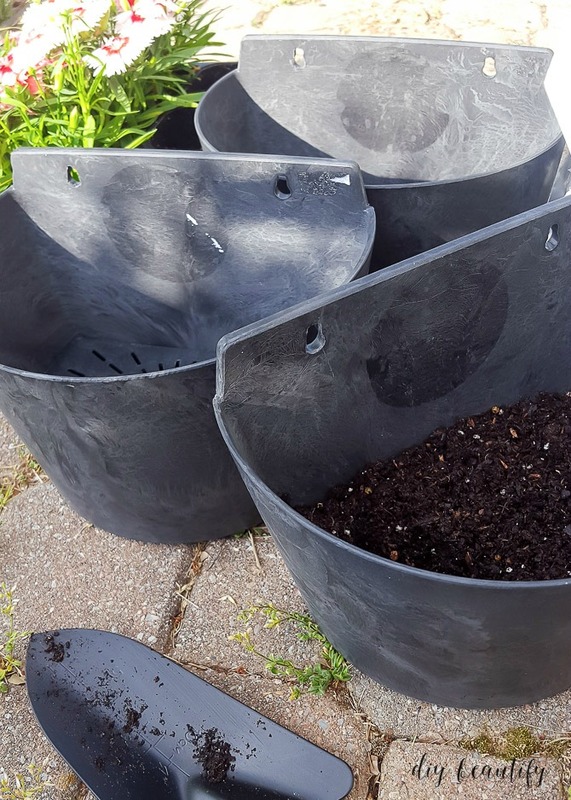 and second, those hanging pots exactly match mine which are lining my stairs, and i need them! At Home is a fun place to shop! You can search locations near you from their website! I agree that those hanging pots rock! I am loving them :) Thanks for stopping by! Thanks for such a nice tour of a beautiful house. It really peace my eyes. It will be perfect place for spring season.